Successfully Added Tiny In-Ear Audio Bud with Bluetooth Hands Free Kit to your Shopping Cart. This cool little Bluetooth set comes with a super tiny Bluetooth earpiece and a transmitter to hang around your neck. This Bluetooth earpiece is super tiny and works perfectly as a hands free kit for you phone calls. The Bluetooth Earpiece looks like an earplug with a tiny antenna, and slips comfortable into your ear, where no one can easily detect it. You then have the wireless Bluetooth control device which you can hang around your neck. Receive and reject calls and secretly communicate. This Bluetooth Hands free set is the perfect buy for those who want to have a secret conversation using mobile technology. 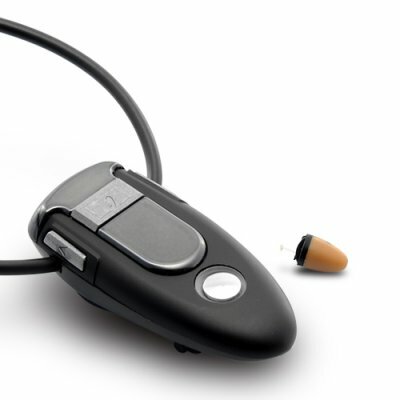 With this tiny earpiece, you can receive instructions through your phone without anyone noticing. This is what true secret agents use and with this device you can cheat on tests, get advice when talking to girls from your friends, and scout out dangerous places whilst someone acts as your lookout. Because of its size the device doesn’t output a high volume, however when positioned into your ear you should be able to hear well enough to understand what’s being said. If you want to cheat on a test at school, then this is the device to use. You can secretly communicate with someone else calling you. This great Bluetooth set is incredibly simple to use and you can get it up and running very quickly. It’s also extremely compact and portable, the device can hang around your neck and the earpiece is so tiny, it takes up hardly any room. You can rely on this cool little gadget to secretly and covertly deliver information to you whenever you want, and no one will detect the incredibly small Bluetooth earpiece you are wearing. How to turn on device: Connect Bluetooth headset, hang around your neck, and put the receiver device in your ear, receive calls secretly.